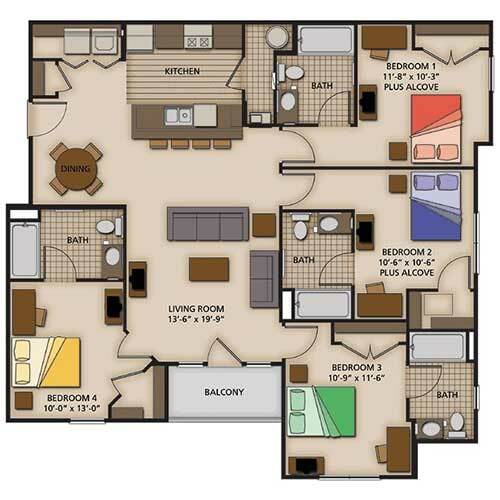 Capstone Quarters offers thoughtfully-designed floor plans with your privacy and comfort in mind. Every bedroom has its own private bathroom, and the share living areas are open and spacious. Choose from a two-, three-, or four-bedroom plan, each offering huge closets and a utility room with washer/dryer. $99 security deposit and 10 & 12 month leases available. This 900-square-foot apartment has two bedrooms and two bathrooms on a split floor plan. The common area features a large living room, a foyer with coat closet, a galley-style kitchen with breakfast bar, and a laundry room. Per-room rent is $625 per month. 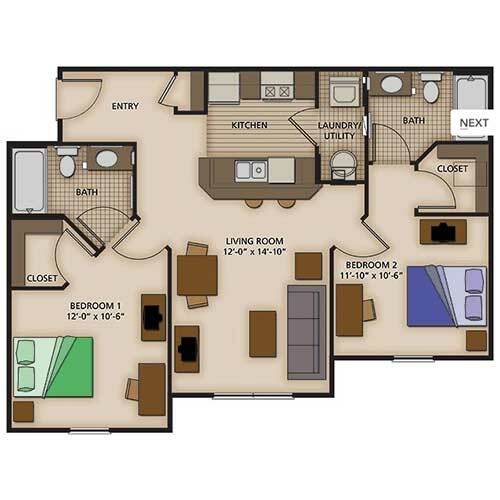 The two-bedroom select features 821 square feet of living space. 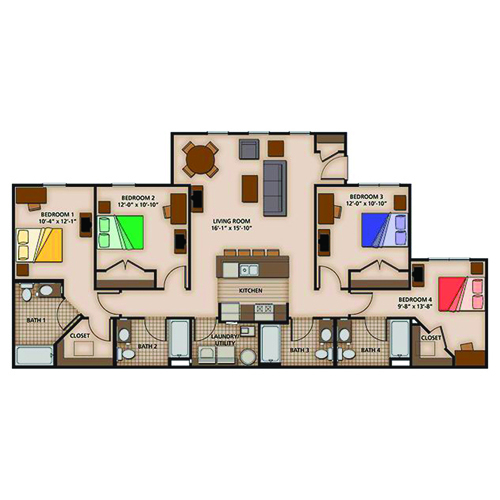 This split floor plan has a bedroom with private bath on either side of the apartment with the living/dining room and galley-style kitchen with laundry room in the center. 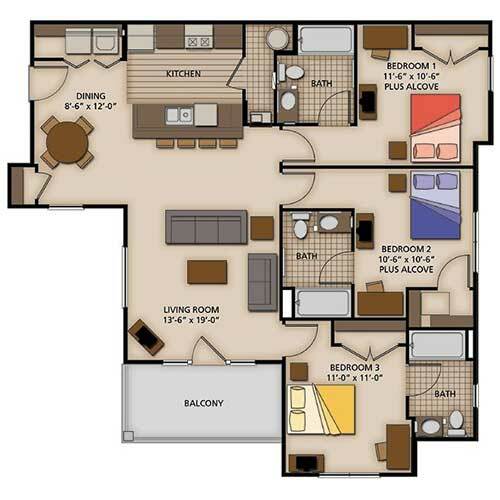 This floor plan rents for $625 per room. This three-bedroom, three-bathroom apartment has 1,400 square feet of living space. Every bedroom has a private bath, large closet, and a study alcove. The common area includes a galley-style kitchen with breakfast bar, a storage closet, a dining room with utility room, and a large balcony located off the living room. This apartment is $575 per month per room. This 1,403-square-foot apartment has two large bedrooms with walk-in closets and private baths and a smaller third bedroom with access to the third bathroom. 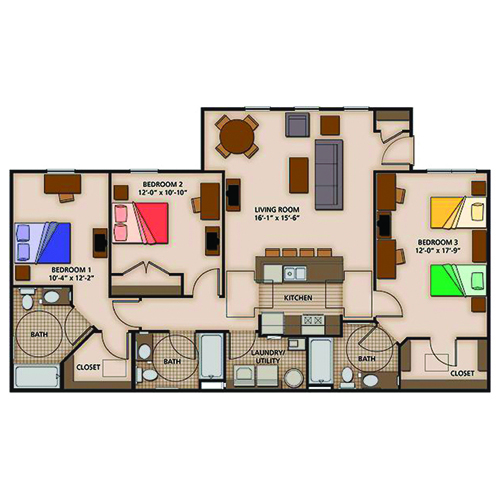 This floor plan includes a pass-through kitchen with breakfast bar, a laundry room, and a large living room. 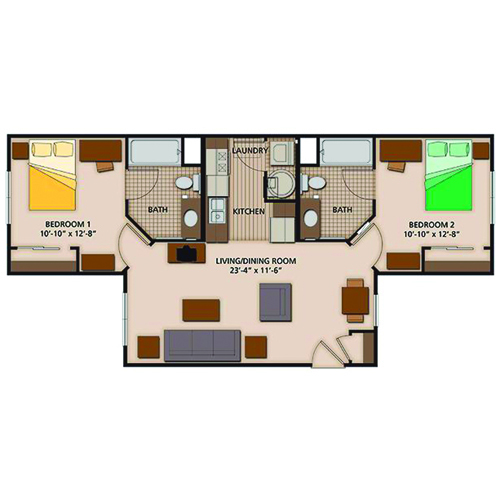 Rent for this mixed floor plan is $525-$625 per room. Enjoy 1,540 square feet of living space in this four-bedroom, four-bath apartment. Each bedroom features a private bathroom, large closet, and a study alcove. The galley-style kitchen features a breakfast bar and a storage closet. The laundry room is located off the dining area. The living room has access to the patio/balcony. Rent on this floor plan is $525 per month per room. This spacious apartment contains 1,547 square feet of living space. This floor plan features two large bedrooms with private baths and walk-in closets and two additional bedrooms with spacious closets and access to the third and fourth bathrooms. This apartment also contains a pass-through kitchen with breakfast bar and an open living area. Rent for this unit is $475-$525 per room.